Patricia Mary Knox was born in Lower Hutt, New Zealand. She was the third daughter in a large family. She did not go to secondary school as times were tough during the Great Depression. She educated herself by going to night classes. She became a prolific reader and this continued throughout her life. She was tenacious, determined and set herself goals and was not afraid to take up challenges. When she expressed a wish to become a missionary she over rode the family’s objections and entered the novitiate at Heretaunga, New Zealand. After profession she served for a few years in communities in New Zealand including Anglesea St, Auckland in Ponsonby which led eventually to the establishment of St Anne’s Maori Girls’ Hostel. She was missioned to Samoa in 1953 where she taught for six years before returning to New Zealand for Loreto Hall (Teacher Training) and studies at Auckland University. After studies, she returned to to Samoa where she became the Head Teacher at Leauva’a 1962 -1964. Her liveliness and delightful sense of humour was often needed in the crowded classrooms. She loved her pupils and they loved her. Sr M Dominica returned to New Zealand in 1965 for health reasons. The next twelve years were, in hindsight, a personal preparation for the work she was to do in the future. She felt called to be a ‘wounded healer’ and took up Psychiatric Nursing studies. She loved this ministry. She went on to become a psychotherapist and counsellor. She spent time in the USA in Denver and Kansas before returning to New Zealand. In 1985 she began the Anawim Centre in Point Howard, overlooking the Wellington Harbour. This was truly a place of healing for hundreds of people over the years. 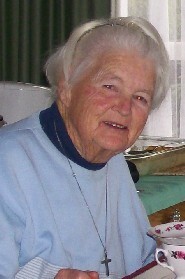 In 1997 she continued her healing ministry in Lower Hutt until 2005. SMSM highlights for Sr M Dominica (Dom) were her Marist renewal in Rome and Pilgrimage in France in 1992 and her Golden and Diamond Jubilees of Religious Profession. Sr M Dominica moved into the Home of Compassion in Silverstream on 14 October 2010. On 7 January 2011 she had a fall after a slight stroke and died peacefully in her sleep on the morning of 8 January 2011. She is laid to rest at the Taita cemetery. May her deep faith and strong sense of commitment to God bring her the reward which is in store for her. May she rest in peace.